Join the discussion on our forums! Come discuss Hooded Acolyte over in our dedicated Hooded Acolyte discussion topic. C'Thun +1/+1 (wherever it is). Wait, what kind of acolyte doesn't wear a hood? Works splendidly well with Circle of Healing or Holy Nova, you can run some of your minions into your opponent's, then use Circle of Healing if your opponent has no minions or Holy Nova if he/she does and give your C'Thun like +4/+4 or +5/+5 (take note that healing face will still buff C'Thun) and clear your opponent's board. Add a Northshire Cleric or even another Hooded Acolyte for even more craziness. Late game is where the Acolyte gets really important. By now you've gotten pretty big minions like Doomcaller or Twilight Darkender (BTW, if you are playing C'thun Priest, the latter is REALLY important. It's like Reno, but better) which means they draw attention away from Acolyte. This basically means you can keep on ramming big guys in and summoning small guys for healing buffs that eventually make your C'Thun go really berserk. Really serious here, but I don't think this card should be 4 mana. It really should be nerfed because it has really great game-changing abilities. Either that or give it a higher rarity. A common rarity? On this guy? A 4 mana 3/6 for priest even by itself is pretty amazing. 4-mana with a 3/6 body? Pretttttyyyy gooood! Stats are similar to Twilight Guardian and Water Elemental. Plus a chance to buff C'Thun. This looks very fun in C'Thun decks! It practically is a major card for C'Thun Priest. Throw this sucker out on turn 4 with either an elder or a Beckoner on the board, and BAM! You've got a sticky minion few will try to clear (seriously, I've played C'Thun Priest since Day 1 of WoG. I have yet to see some guy destroy my Acolyte when I have an Elder on the board.) that can be a real threat if left unchecked. Very nice card. Priest and Druid will be the most played C'thun classes! Water Elemental body that has synergy with Twilight Darkmender, quite promising. This card could see play in some decks without running C'Thun to be honest. Or in a deck running limited C'Thun procs. Nice body for the cost. I don't see that happening. Priest doesn't need a vanilla 4 mana 3/6, Holy Champion is just a much better choice in that case because of its potential upside. 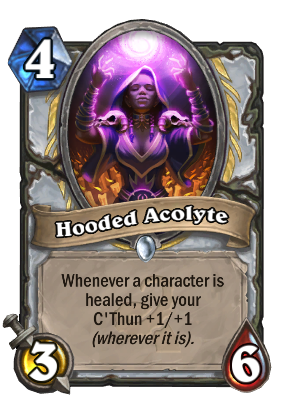 so a 4 mana 3/6 (good stats) that has the potential at a random stage in the game to be combined with something like wild pyromancerand circle of healing , or even holy nova to make a huge c'thun buff and immediatly win you the game when you play c'thun?? That is an understatement. Considering its effect and the need to get this off the board asap the stats are pretty amazing. Going to be some crazy circle of Heal combos off this. 0 mana, give your C'Thun like +7/+7 or +8/+8. Seems balanced.